Are you interested in a health conscious franchise opportunity in a growing smoothie industry that does over $2 billion in annual sales in the United States alone? At Smoothie Factory, we're looking to team up with motivated, ambitious entrepreneurs who want to bring fresh, nutritious smoothies and juices as well as other healthy products to their communities. More and more consumers are pursuing a healthier lifestyle that includes a diet high in fruits and vegetables. Smoothie Factory Juice Bar franchise owners are uniquely poised to serve this growing market. Smoothie Factory is an internationally-known smoothie and juice bar franchise with existing stores in the US, and international development throughout China, India, and Vietnam through our founder James Villasana & SF Inc. Founded in 1996 with an emphasis on owner-operator success, approximately 95% of all Smoothie Factory locations are operated by the owner. In 2013 Smoothie Holdings, LLC was acquired by BRIX Holdings, LLC of Dallas, Texas, an experienced franchise operating company and parent company of Red Mango and RedBrick Pizza. BRIX controls the Smoothie Factory franchising rights for the USA, Canada, Mexico, and South America. When you own a Smoothie Factory it is more than just a juice and smoothie franchise. In addition to a full line of delicious smoothies and nutritional boosts, franchisees also benefit from offering fresh-squeezed juices, and health supplements (both private label and brand name). A Red Mango® co-branded frozen yogurt opportunity and expanded menu including wraps, flabread sandwiches, and salads is also possible. These varied product offerings not only are intended to add revenue, they help differentiate your juice and smoothie franchise from competitors. Instead of a single business, you're getting four in one! 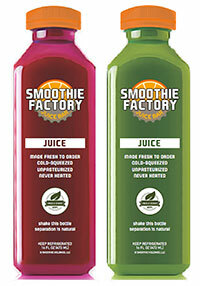 Smoothie Factory® Juice Bar stands alone in the industry for superior products in four categories. Founded in 1996 by former Olympian James Villasana, Smoothie Factory Juice Bar features only the best products with the highest quality ingredients. Smoothies are freshly-made with real fruit, and contain no syrups, no concentrates and no purees. Fresh, cold-squeezed juices are freshly-made with fruits and vegetables. They are then immediately cooled, bottled and served with a tamper/air-proof lid at our stylish juice bar. 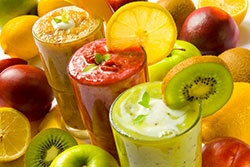 Smoothies are a proven global industry, matching consumer demand with a healthful treat. And the opportunity to grow continues. 4 billion+ smoothies served at restaurants. $2 billion+ in annual U.S. sales. Fresh, cold-squeezed juices offer huge growth potential and are a perfect complement to the smoothie business. $5 billion in annual worldwide sales and growing. Combines daily nutrition with active lifestyles. When you become a Smoothie Factory® franchisee, you may be going into business for yourself, but you'll never be alone. Our franchising system is built on the principle that we can only be successful if our franchisees are successful, and it shows. Are you excited to take the next step towards opening a Smoothie Factory® franchise? To learn more, fill out the form and we'll contact you shortly to follow up on any questions you might have. We look forward to speaking with you!